As if reciting the rosary, Jeni Spota paints the same religious scene again and again, canvas after canvas. 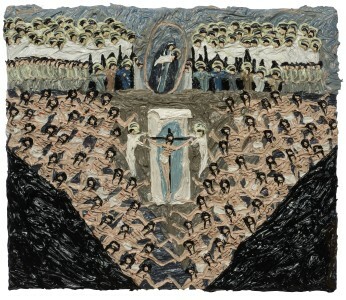 Each small panel depicts a three-tiered last judgment in which the crucifixion is sandwiched between angels in heaven above and sinners in hell below. Typically, Christ presides over the last judgment (which took place after the second coming), but here an image of the Madonna and Child, encased in a mandorla, is the keystone. This iconographic interruption is not Spota’s invention, but a direct quote of a tableau vivant from Pasolini’s Decameron (1971), an adaptation of Boccaccio’s 14th-century allegorical tales, that focuses on Giotto. In the film, the artist is shown consulting a drawing of a commissioned fresco, but a single panel still needs to be planned – how will he fill in the scene? Giotto is shown in a crowded market drawing inspiration from daily life, but he is struck by a moment of clarity while sleeping. In his dream he sees this last judgment with the Virgin above. Accordingly, all of Spota’s paintings are titled ‘Giotto’s Dream’. These scenes aren’t overly concerned with historical accuracy and it isn’t immediately obvious that the Madonna, or any of Spota’s other additions, do not ‘fit’ into the original iconic scene. Instead, the artist seeks to depict a feeling of weighty religious allegory by appropriating the readymade Catholic mysteries, seeming to tap into Italian Catholic imagery, from Boccaccio to Giotto to Pasolini, and ride the wave of artistic heritage. An aura of sanctity is available to those who can arrange specific elements into a magical configuration. Does divinity reside in Pasolini and Spota’s depiction of Giotto’s dream of the last judgment? If not, the age-old compositions are still remarkably good looking showpieces of a lost culture; they don’t invite prayer, but worship iconography’s stately fixity – Christ and Madonna rendered by centuries of rote symmetry. Dreams, like dusty icons, are the residue of yesterday’s anxieties. Giotto’s lightning-bolt epiphany promotes a funny little myth of creative inspiration and to perpetuate it in paint is to become swept away by the romance of historical fiction.